G’morning folks, we currently have a 40’ Tiffin Phaeton than we really enjoy while we are in a nice RV park somewhere. It really is nice. We’ve had it for 4 years, but really only got significant usage out of it the first year due to a medical issue with my wife in our second year, then cancer for me in our third, and then a 750 mile interstate move in the 4th summer. We plan to take her our from late April or early May this year and basically explore for 3-5 months. This part is fine, but out west where we are, there don’t seem to be many places she’ll fit, as far as state parks or national parks are concerned. So we stay outside the park at an RV facility and drive in with the toad. That said, I’m beginning to get tired of doing all the driving (wife can’t drive much anymore because of her condition...locally is ok, but big trips, long trips, and unfamiliar territory is not good for her, and she cannot drive the rig), all the hitching and unhitching, set-up and breakdown, most of the cooking, and having to stay outside of the places we most want to visit. So this trip with with the Phaeton may be our last. We are considering a small class C, like a Winnebago View/Navion 24v on the sprinter chassis, or, a Thor 25v on the ford chassis, and go without a toad. My wife has already vetoed a B van...too small. She seems to agree to either of the above C class rigs with the twin/convertible to King configuration. 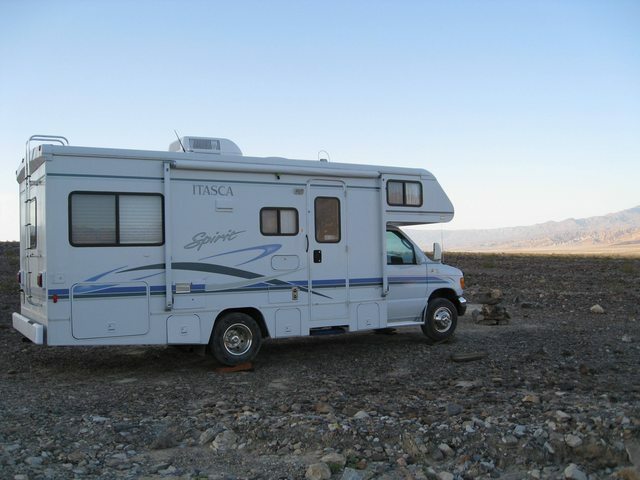 Here's our 24V Itasca Class C boondock camped in Death Valley. We have RV'd all over the U.S. in it with no toad - both in commercial campgrounds and boondock camping out in the middle of nowhere. We hope to take it to Alaska soon. We've got the Navion 24V and like it. Great fuel economy, diesel engine and transmission combo are impressive. The twin bed layout is the one we liked over the rest, and it works well for us. So, my first recommendation would be, if at all possible, hold off until they're taking orders for the new 2020 models. I posted up some of the more notable improvements and added standard equipment conveniences I saw at a glance on the prior link, to this thread on another forum. Assuming you get one of these, there's really no show stopping reason you can't drive one of these as a touring machine, without a towed. Our maiden voyage in ours last Fall saw us do a huge circle tour of the US starting in Michigan, west towards Arizona, then back towards the Gulf Coast and home. With no towed. The only issues we discovered besides doing the shopping before setting up camp were the requirement for a source of propane for cooking and heat, and always making sure the diesel fuel tank was full, also before setting up camp. Setting up camp for us amounted to hooking up our electric/water/cable connections and we dumped our holding tanks as needed. Set up and break down are pretty straight forward with our Navion. So whether we're stopped in a rest area for a few hours of sleep and just put it in "P", or a NPS campground for the night with a full set up, it's pretty easy once you do it a few times. That said, we towed a month ago, on a similar trip across the lower 48 east to west and back, and only needed the convenience of the towed because where we stayed wasn't near any shopping. We had to drive about 30 miles one way to Yuma for supplies. If you're camped near a mid-sized town with shopping within walking or biking distance, you could easily get away without pulling a towed. The Navion pulled our Wrangler easily, and as I said, it was handy having it along for the week we were stationary. I'm sure either option would work for you, since you have the experience. If the touring option (no towed) suits you, it would be a no brainer for you and your missus. Thank you! This is very good to know. Yes, we were planning to wait until the 2020s come out to decide. As I said, we love the Phaeton, but there are so many places we can’t go with it. If it were solely up to me (hint: it isn’t), we’d have two units, the Phaeton for resort style rv parking, and the View/Navion, or even a trailer to tow behind our truck. We were pulling a 35’ bumper tow trailer before, and DW was hooked once she saw the decked out Phaeton. I told her we could get the Phaeton if she would agree to having a small trailer for the stuff I wanted to do, but oh, how quickly those things are forgotten. In the meantime, we moved from a 2 acre place with a big home and a shop for the Phaeton to a 1/3 acre city lot with no RV storage and no overnight parking allowed on the street either. So if we had two units, the storage cost goes up, not to mention the cost to own the second unit. Anyway, she says she’ll be ready to downsize after this summer, and the “no toad” logic is clicking with her as well, so we’ll keep an eye out for the new models when they come out. It is a very individual issue and question, but personally I would not want to have to "break camp" every time I want to leave my campground/base and go touring for the day. Add to that the difficulty of parking a 25 foot vehicle in cities, etc. If I were you I would use the C to tow a small car such as a Fiat 500 or a Mini, thus getting the best of both worlds. You might want to explore the View on Winnieowners.com. One thing to take into account in considering whether or not you need a toad is how severely your health situations limit your ability to walk. On the other hand, you can always rent and, in urban/surburban areas there's always Uber and bicycles if you're physically up to it. Have you looked at some of the B+ (or B Plus) motorhomes? I've seen some that are somewhat like a compact class A. In any case, whatever you buy, get something that's capable of towing at least a subcompact toad (if not your existing toad) so, if you later determine you do need a toad, you're not stuck with a MH that's not up to the task. Glad I could help. If my post seemed like a sales pitch, it's because we're seriously thinking of trading in our 2018 on a 2020, when the details are available. I've already got the feelers out to my dealer to let me know the minute he has the dealer order/options sheets, and we'll see what we can do. I'm not a dealer/agent nor do I have anything to do with RV sales or Winnebago, I'm just someone who likes our motorhome choice and am very interested in finding out more about the newer models. The Navion handles like a class B van, although it has more room and a full bath. Not as roomy as a Phaeton, but we manage to make do with it. We did most of our first 8 years in a Roadtrek class B van on the Chevy 3500 Express van chassis which allowed us to see (almost) everything in North America, and it went from the Everglades to Denali, and from San Diego to the Maritimes and back a few times. It was a workhorse and we had very few problems with it mechanically. We got tired of the tight fit after 8 years, and sold it and bought a larger (to us) Class A gasser Sunstar, but didn't like the engine/doghouse noise, the height and width didn't sit well with my wife, the ride and handling, and the fuel economy was terrible. In it's defense it was an entry level coach and the fit and finish were also suspect in places. It did give us the room we desired so it fulfilled that need. We thought we'd like the extra room and the full bath, but it wasn't meant to be. So we only did the one 4,000 mile trip in 2017 in the Sunstar, and that was enough for us to decide to downsize a bit (again). We saw a recently delivered Navion 24V low profile with the big forward overhead window at our dealer, when we out there trying to figure out the next move, and that was that. We did a little research on them, and ordered and optioned a 2018 model year in Fall 2017. Traded the Sunstar in, picked up the new unit last March, and have already put 21,000 miles on it in 2 long trips and 4-5 shorter ones in the Michigan UP and back. We really think this size is better for us, at our age, and with our own health issues. My wife likes that it's "smaller than a Class A, but bigger than a Class B". I sometimes wonder if we had gone to a small DP instead of the gas Class A, would we still have it, and I think we might, but that's just speculation. I like bigger, and have no problems (yet?) with the towed hook/unhook thing, although it would be nice to have a trailer to just drive into and close the door, like your setup. If you did decide to tow, our Wrangler weighs in at around 4400 lbs. loaded for travel. We just pulled it 7,000 miles all over the lower 48 from eastern Michigan to Baton Rouge, LA to Tacna, AZ, and back to Bonita Springs FL, looking for some places to snowbird, and the Navion had no problem functioning as the tow vehicle. Our overall (city/highway) average fuel economy when not pulling the Wrangler is 15.5 mpg, and when towing the Jeep, it drops to around 12.75 mpg. If you're curious. If you have any other questions about specifics, feel free to pm me. If you like Tiffin look at the Tiffin Wayfarer. https://tiffinmotorhomes.com/class-c. They are already producing the 2020 model on the new Sprinter chassis. Make sure to look at the carrying capacity for any of the Sprinter-based Class C's. We have decided on the Wayfarer. There is just two of us and we can make the weight limits work. As you probably know Tiffin has great service and we live only about 2 hours from the Wayfarer factory. Great point, and I've said it before, that the Sprinter based class C motorhomes are sometimes "OCCC challenged". Make sure to verify the OCCC on whatever make/model you're interested in before you buy. Some only have a few hundred pounds of cargo/people weight capacity because the upfitter has used it up with whatever they've added to it. Like full side slides and hydraulic leveling jacks. Beware. We have owned what is called a B+ years ago. Took one trip without a tow vehicle and never again. It was great traveling, but for any city (not big city either) it was the pits. We have owned two Winnebago class c’s... Aspect and Cambria. Both were 30’ with three slides and tow our CRV. Both C’s are gas. Never had problem traveling coast to coast or getting into or out of places... or worried about bridges. With three slides we have plenty of room ( for three big dogs). You have lots of options out there and time to look. You will find a good fit for both of you, but in my opinion, tow vehicle is only way to go...just less hassles. We have a 2016 Renegade Vienna on the Sprinter chassis. No Toad and love it. Live in NC and have been from NY to FL to IL to NV. Pretty good swath of the country with no problems at all. Been to large cities and way out of the way places. So far have always been able to find a place to park. I use the satellite view on my Apple Maps app to scope out where we are going and look for large surface lots. We may have to walk a bit to our "attraction" but we are still capable of doing so. Seriously, with a bit of research, parking has not been an issue. The upside is not hauling around a toad. The fuel is one thing, the other is the hooking and un hooking. People see to complain about "breaking camp" but really? Unscrew a hose and disconnect an electrical plug and go. What is the big deal? OK maybe you had the sewer hose out as well. Just takes a few minutes. I usually do all of that while DW is getting ready. Last thing is to pull the power plug just after the hair dryers quits. Press one button to retract the levelers and away we go. The size (plus the EXCELLENT fit and finish of the Renegade product) were the reasons we bought this particular RV in the first place. Looked at B's with parking the top issue but quickly realized they were too small. The Sprinter seems to check all of the boxes. Big enough for 2 and a small dog yet small enough to park just about anywhere. If you haven't looked at the Renegade I encourage yo auto do so. I am pretty picky and I am absolutely impressed with the quality of the build. Nothing "flimsy" or "cheap" at all. We have a 2016 Renegade Vienna on the Sprinter chassis. No Toad and love it. Live in NC and have been from NY to FL to IL to NV. Pretty good swath of the country with no problems at all. Been to large cities and way out of the way places. So far have always been able to find a place to park. I use the satellite view on my Apple Maps app to scope out where we are going and look for large surface lots. We may have to walk a bit to our "attraction" but we are still capable of doing so. Seriously, with a bit of research, parking has not been an issue. The upside is not hauling around a toad. The fuel is one thing, the other is the hooking and un hooking. People seem to complain about "breaking camp" but really? Unscrew a hose and disconnect an electrical plug and go. What is the big deal? OK maybe you had the sewer hose out as well. Just takes a few minutes. I usually do all of that while DW is getting ready. Last thing is to pull the power plug just after the hair dryer quits. Press one button to retract the levelers and away we go. The size (plus the EXCELLENT fit and finish of the Renegade product) were the reasons we bought this particular RV in the first place. Looked at B's with parking the top issue but quickly realized they were too small. The Sprinter seems to check all of the boxes. Big enough for 2 people and a small dog yet small enough to park just about anywhere. If you haven't looked at the Renegade I encourage you to do so. I am pretty picky and I am absolutely impressed with the quality of the build. Nothing "flimsy" or "cheap" at all.